Deinotherium, Art Print, 13" x 19"
Home | DINOSAUR PAINTINGS | Deinotherium | Deinotherium, Art Print, 13" x 19"
Prehistoric mammal Deinotherium by Josef Moravec. The picture is printed on premium photo quality super "B" paper 13" x 19". 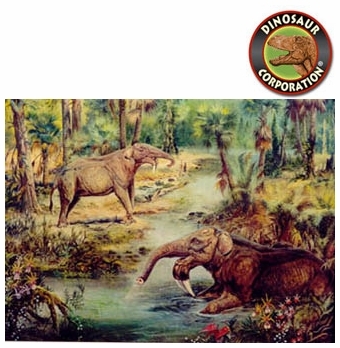 Original oil painting by Josef Moravec is in Art Collection of Dinosaur Corporation.